The New One had Nigel Twiston-Davies dreaming of glory from the first time the gelding began to work at home. And the trainer's judgement was justified with a four-length romp to victory in the Neptune Investment Management Novices' Hurdle. "He has always showed magical speed," said Twiston-Davies, "and took to jumping like a natural. His attitude to everything is almost as if he had already done it all in another life. He was winning only four months after he was broken in. He was the full package right from the start." The New One gave Twiston-Davies fine compensation for former Betfred Gold Cup winner Imperial Commander's late defection from the meeting. "This one was always our best chance of the meeting anyway," he said, "and having Sam [his son] ride doubles the pleasure." The New One, a five-year-old by King's Theatre, has been beaten only twice, when he was sixth in last year's Weatherbys Champion Bumper and runner-up to At Fishers Cross over today's course and distance in January. "We're still trying to work out how he got beat in the bumper," said Twiston-Davies, "but he came out and beat My Tent Or Yours next time, so we knew what we thought of him was right. It was simply the heavy ground did for him back in January. "It's what we have been waiting for and it worked. I didn't see the race - I'm afraid that I got gut-ache and I was in the loo. I only saw the last hurdle. "We knew which horses were right and which were wrong. We knew he was right." Two subsequent winners of the Champion Hurdle, Istabraq and Hardy Eustace, are among the winners of the Neptune Investment Management Novices' Hurdle, and the two-mile title may be The New One's target next year. "He's got class and a turn of foot," said Twiston-Davies, saddling his 14th Festival winner "so why ever not?" Jockey Sam Twiston-Davies posted his first Festival victory as a professional as 7/2 second-favourite The New One stormed to a four-length victory in the Neptune Investment Management Hurdle. Twiston-Davies had ridden Baby Run to victory in the CGA Foxhunter Chase when an amateur back in 2010. "He was very good today. 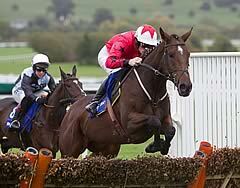 He showed a very good turn of foot and I am absolutely delighted," said Twiston-Davies. "I probably got it wrong last time out as I rode him more of a stayer than a speed horse but you've got to learn from your mistakes! He's actually quite a speedy type so I thought I'd give him that sort of ride and it's worked out. "He really picked up coming down the hill and when I asked him to go he just took off. There's obviously been a fair bit said about our horses but when the likes of Ackertac (second yesterday at 66/1) run like they do, it gives you a bit more confidence. It also helps when Willie Mullins' horses are running so well - it takes the pressure of you a bit! "A lot of credit goes to Wayne Jones - he looks after the horse every day, rides him out and he has got him in top form, so fair play to him. "Riding this horse was a great chance and you have to grab it with both hands. Luckily everything worked out well today. "He'll probably jump a fence in time but I would have thought that might be in a couple of years. He's only five so I'd imagine we'll have another season over hurdles with him - it's just a shame there's not a two-and-a-half mile championship hurdle at The Festival. Twiston-Davies' younger brother Willy, an apprentice on the Flat, was delighted for both Sam and his father after the race. "It's great to see Dad (Nigel) and Sam have a winner like this after what's happened over the past couple of weeks," he said. "It's great to be here at Cheltenham but I'm not a great spectator - I probably get more nervous than both of them!" "It's a massive boost for everyone in the yard." The New One's owner Sarah Such said: "We knew that he was going to do that, just knew it. To all of the doubters - we did it and we have put you right. I had all the faith in Nigel. "We couldn't get a name for him and, every time we saw him on the gallops, Nigel would say "this is the new one with no name" and it just stuck. " Horses trained in Ireland made up a strong team for the Neptune Investment Management Novices' Hurdle, but they had to be content with a second and third as victory went to The New One, trained locally by Nigel Twiston-Davies. Runner-up Rule The World carried the Gigginstown House Stud colours into second at 5/1, four lengths behind the winner, while a further four and a half lengths back in third was the 6/4 favourite Pont Alexandre, representing owner Susannah Ricci and a rare reverse for jockey Ruby Walsh and trainer Willie Mullins. Mouse Morris, who trains Rule The World, said: "He's run a blinder, but he's been beaten by a better horse on the day. He'll be a better horse with another year on his back. You might see him at Punchestown, but we'll see how he comes out of this race first. He's a big, lean bugger and still a frame of a horse." Mullins said: "Ruby said he wasn't travelling from a long way out. Maybe soft ground is the key, but I'm disappointed. We'll probably go to Punchestown." The Neptune Investment Management Novices’ Hurdle was introduced to The Festival in 1971 as the Aldsworth Hurdle. Sun Alliance, who merged with Royal Insurance in 1996, took it on in 1974, together with the Sun Alliance Chase, having previously sponsored the Foxhunter Chase. Ballymore Properties sponsored the contest between 2007 and 2009, while Neptune Investment Management backed the race for the first time in 2010. The Neptune Investment Management Novices’ Hurdle, along with the Albert Bartlett Novices’ Hurdle and the RSA Chase, are acknowledged as championship races for the staying novice hurdler and chaser. The smallest field for the Neptune Investment Management Novices' Hurdle was in 2011, when 12 runners lined up. There have been 15 runners on four occasions - 1973, 2004, 2007 and 2008 while 14 went to post in 2000 and 2009. The largest field was 29, achieved in 1979, 1984 and 1991. The current safety limit is 24. The most successful owners are Anne-Marie McGowan, Maggie Heath and J P McManus, with two wins each. The most successful trainers are Aidan O’Brien, David Nicholson, Edward O’Grady, Martin Pipe, Mick O’Toole, Nigel Twiston-Davies, Oliver Sherwood and Willie Mullins, who have each won the race twice. Charlie Swan won the race three times and is the most successful jockey. Among current riders, Jason Maguire and Ruby Walsh have both won the race twice. The Irish-trained 1994 winner, Danoli, subject of a massive gamble, was sent off the 7/4 favourite. The shortest-priced winner was another Irish victor, Mr Kildare, at 8/11 in 1978. Favourites have been successful in 14 of the 41 runnings (34 per cent). The longest-priced winner was 40/1 chance Even Dawn in the second running in 1972. The Irish have an excellent record in the Neptune Investment Management Novices’ Hurdle with 16 wins, including six consecutive victories from 1973-78. The latest success came from the Mouse Morris-trained First Lieutenant in 2011. Oliver Sherwood and Dessie Hughes are the two trainers to have also won the race as jockeys. Sherwood was in the saddle on Venture To Cognac in 1979, while his training wins were with The West Awake (1987) and Rebel Song (1988). Dessie Hughes was twice successful as a jockey with Davy Lad (1975) and Parkhill (1976) and sent out Hardy Eustace (2003) to victory as a trainer. Istabraq (1997) and Hardy Eustace (2003) both won this race en route to victory in the Stan James Champion Hurdle, while Davy Lad (1975) went on to take the Betfred Cheltenham Gold Cup. Only one horse has won both the Neptune Investment Management Novices’ Hurdle and the RSA Chase. The West Awake took the hurdle race in 1987 and the chase event a year later.